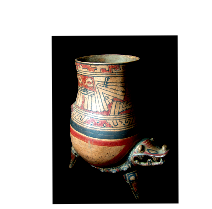 A feline amulet from the Valdivia culture. Made from the important Spondylus Shell. Crouched Jaguar with geometric patterns throughout its body. Perforation to nose. Stage 2 Palmer Notched Incised. Carved stone figurine with face and legs indicated (notched). 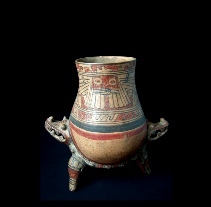 This Formative culture represents the earliest known appearance of this form of artistic expression in the New World. 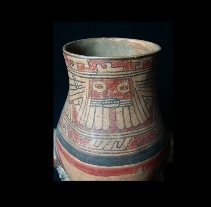 Similar examples in Ancient Ecuador - Culture, Clay and Creativity 3000-300 B.C.